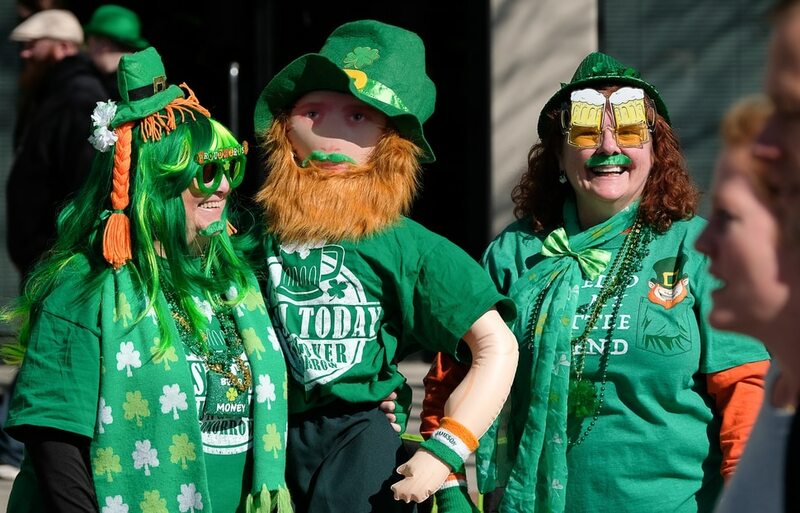 (Francisco Kjolseth | The Salt Lake Tribune) Terrie Orton, left, and JoAnn Langenegger join the fun from the sidelines as Salt Lake CityÕs Irish community celebrates their 41st annual St. PatrickÕs Day Parade with crowds lining up to take in the festivities. Marching bands, Irish dancers, bagpipes and a sea of green moved along 200 South, starting at 500 East Saturday morning en route to State street where the Siamsa festivities kept the fun going at the Gallivan Center. 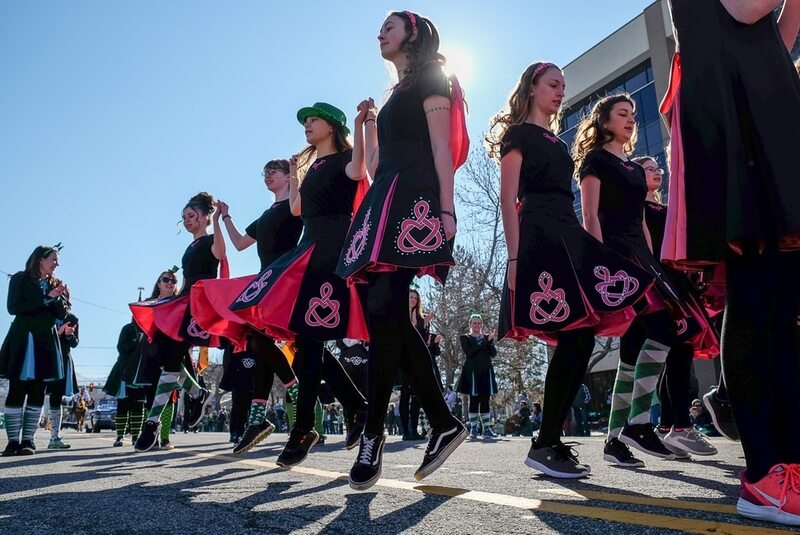 (Francisco Kjolseth | The Salt Lake Tribune) Members of the An Dragan Ceilteach Irish Dancers jump and dance as Salt Lake CityÕs Irish community celebrates their 41st annual St. PatrickÕs Day Parade with crowds lining up to take in the festivities. Marching bands, Irish dancers, bagpipes and a sea of green moved along 200 South, starting at 500 East Saturday morning en route to State street where the Siamsa festivities kept the fun going at the Gallivan Center. (Francisco Kjolseth | The Salt Lake Tribune) Members of the El Kalah Mini-Bike squad ride in formation while shamrocks and sunshine were aplenty as Salt Lake CityÕs Irish community celebrates their 41st annual St. PatrickÕs Day Parade with crowds lining up to take in the festivities. (Francisco Kjolseth | The Salt Lake Tribune) Shamrocks and sunshine were aplenty as Salt Lake City’s Irish community celebrates their 41st annual St. Patrick’s Day Parade with crowds lining up to take in the festivities. Marching bands, Irish dancers, bagpipes and a sea of green moved along 200 South, starting at 500 East Saturday morning en route to State street where the Siamsa festivities kept the fun going at the Gallivan Center. (Francisco Kjolseth | The Salt Lake Tribune) Buckaroo Bob, also known as Travis Makinen goofs around with the crowds as Salt Lake CityÕs Irish community celebrates their 41st annual St. PatrickÕs Day Parade with crowds lining up to take in the festivities. (Francisco Kjolseth | The Salt Lake Tribune) Sarge the great dane waits his turn in line to join the 41st annual St. PatrickÕs Day Parade in Salt Lake City. (Francisco Kjolseth | The Salt Lake Tribune) Paytin Driscoll, 7, dances along to the sounds of various bands playing as Salt Lake CityÕs Irish community celebrates their 41st annual St. PatrickÕs Day Parade with crowds lining up to take in the festivities. (Francisco Kjolseth | The Salt Lake Tribune) Brock McConkie, 12, joins the Thomas Cordner Memorial Pipe Band as they play along 200 South in Salt Lake City for the 41st annual St. PatrickÕs Day Parade. 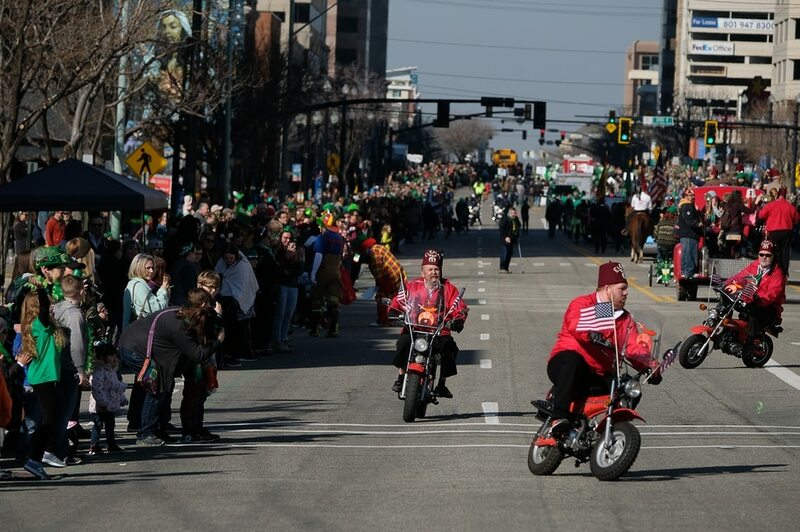 (Francisco Kjolseth | The Salt Lake Tribune) Carl Spitzmacher zips around on his bike as Salt Lake CityÕs Irish community celebrates their 41st annual St. PatrickÕs Day Parade with crowds lining up to take in the festivities. Marching bands, Irish dancers, bagpipes and a sea of green moved along 200 South, starting at 500 East Saturday morning en route to State street where the Siamsa festivities kept the fun going at the Gallivan Center. (Francisco Kjolseth | The Salt Lake Tribune) Roger Chase gets into the spirit for the 41st annual St. PatrickÕs Day Parade in Salt Lake City, on Saturday, March 16, 2019. (Francisco Kjolseth | The Salt Lake Tribune) Shamrocks and sunshine were aplenty as Salt Lake City’s Irish community celebrates their 41st annual St. Patrick’s Day Parade with crowds lining up to take in the festivities. Marching bands, Irish dancers, bagpipes and a sea of green moved along 200 South, starting at 500 East Saturday morning en route to State street where the Siamsa festivities kept the fun going at the Gallivan Center. (Francisco Kjolseth | The Salt Lake Tribune) Utah Friends of Basset Hounds bring much attention as shamrocks and sunshine grace Salt Lake CityÕs Irish community as it celebrates their 41st annual St. PatrickÕs Day Parade with crowds lining up to take in the festivities. Marching bands, Irish dancers, bagpipes and a sea of green moved along 200 South, starting at 500 East Saturday morning en route to State street where the Siamsa festivities kept the fun going at the Gallivan Center. (Francisco Kjolseth | The Salt Lake Tribune) Natalie Sun, 3, dances along to the sounds of various bands playing as Salt Lake CityÕs Irish community celebrates their 41st annual St. PatrickÕs Day Parade with crowds lining up to take in the festivities. (Francisco Kjolseth | The Salt Lake Tribune) Amber Schiavone, center, takes in the fun alongside her daughters Mae, 2, and Sophia Robison, 5, as Salt Lake CityÕs Irish community celebrates their 41st annual St. PatrickÕs Day Parade with crowds lining up to take in the festivities. Marching bands, Irish dancers, bagpipes and a sea of green moved along 200 South, starting at 500 East Saturday morning en route to State street where the Siamsa festivities kept the fun going at the Gallivan Center. (Francisco Kjolseth | The Salt Lake Tribune) Utah Friends of Basset Hounds bring much attention as shamrocks and sunshine grace Salt Lake CityÕs Irish community as it celebrates their 41st annual St. PatrickÕs Day Parade with crowds lining up to take in the festivities. (Francisco Kjolseth | The Salt Lake Tribune) Shamrocks and sunshine were aplenty as Salt Lake City’s Irish community celebrates their 41st annual St. Patrick’s Day Parade with crowds lining up to take in the festivities. Marching bands, Irish dancers, bagpipes and a sea of green moved along 200 South, starting at 500 East Saturday morning en route to State street where the Siamsa festivities kept the fun going at the Gallivan Center. (Francisco Kjolseth | The Salt Lake Tribune) Shamrocks, sunshine and golden shoes were aplenty as Salt Lake CityÕs Irish community celebrates their 41st annual St. PatrickÕs Day Parade with crowds lining up to take in the festivities. Marching bands, Irish dancers, bagpipes and a sea of green moved along 200 South, starting at 500 East Saturday morning en route to State street where the Siamsa festivities kept the fun going at the Gallivan Center. (Francisco Kjolseth | The Salt Lake Tribune) Utah Friends of Basset Hounds bring much attention as shamrocks and sunshine grace Salt Lake CityÕs Irish community as it celebrates their 41st annual St. PatrickÕs Day Parade with crowds lining up to take in the festivities. Marching bands, Irish dancers, bagpipes and a sea of green moved along 200 South, starting at 500 East Saturday morning en route to State street where the Siamsa festivities kept the fun going at the Gallivan Center. (Francisco Kjolseth | The Salt Lake Tribune) Roller Derby's Jammy Dodger, also known as Jennifer Parsons, brightens up her costume with a little contrasting color as shamrocks and sunshine were aplenty while Salt Lake CityÕs Irish community celebrates their 41st annual St. PatrickÕs Day Parade with crowds lining up to take in the festivities. (Francisco Kjolseth | The Salt Lake Tribune) Members of the El Kalah Mini-Bike squad ride in formation while shamrocks and sunshine were aplenty as Salt Lake CityÕs Irish community celebrates their 41st annual St. PatrickÕs Day Parade with crowds lining up to take in the festivities. (Francisco Kjolseth | The Salt Lake Tribune) Members of various Utah Roller Derby teams have fun with the crowds as Salt Lake CityÕs Irish community celebrates their 41st annual St. PatrickÕs Day Parade with crowds lining up to take in the festivities. (Francisco Kjolseth | The Salt Lake Tribune) Troy Oyler gets into the Irish spirit as he joins the parade as Salt Lake CityÕs Irish community celebrates their 41st annual St. PatrickÕs Day Parade with crowds lining up to take in the festivities. Marching bands, Irish dancers, bagpipes and a sea of green moved along 200 South, starting at 500 East Saturday morning en route to State street where the Siamsa festivities kept the fun going at the Gallivan Center. (Francisco Kjolseth | The Salt Lake Tribune) Shamrocks and sunshine were aplenty as Salt Lake City’s Irish community celebrates their 41st annual St. Patrick’s Day Parade with crowds lining up to take in the festivities. Marching bands, Irish dancers, bagpipes and a sea of green moved along 200 South, starting at 500 East Saturday morning en route to State street where the Siamsa festivities kept the fun going at the Gallivan Center. (Francisco Kjolseth | The Salt Lake Tribune) Members of the Gallivan family join the fun as Salt Lake CityÕs Irish community celebrates their 41st annual St. PatrickÕs Day Parade with crowds lining up to take in the festivities. (Francisco Kjolseth | The Salt Lake Tribune) Xiao Ing, takes in the sights as Salt Lake CityÕs Irish community celebrates their 41st annual St. PatrickÕs Day Parade with crowds lining up to take in the festivities. (Francisco Kjolseth | The Salt Lake Tribune) Shamrocks and sunshine were aplenty as Salt Lake City’s Irish community celebrates their 41st annual St. Patrick’s Day Parade with crowds lining up to take in the festivities. Marching bands, Irish dancers, bagpipes and a sea of green moved along 200 South, starting at 500 East Saturday morning en route to State street where the Siamsa festivities kept the fun going at the Gallivan Center. (Francisco Kjolseth | The Salt Lake Tribune) Members of the El Kalah Mini-Bike squad ride in formation while shamrocks and sunshine were aplenty as Salt Lake CityÕs Irish community celebrates their 41st annual St. PatrickÕs Day Parade with crowds lining up to take in the festivities. (Francisco Kjolseth | The Salt Lake Tribune) Kevin Cottle and his daughter Charlotte, 12, get a friendly visit from one of the basset hounds as Salt Lake CityÕs Irish community celebrates their 41st annual St. PatrickÕs Day Parade with crowds lining up to take in the festivities. Marching bands, Irish dancers, bagpipes and a sea of green moved along 200 South, starting at 500 East Saturday morning en route to State street where the Siamsa festivities kept the fun going at the Gallivan Center. (Francisco Kjolseth | The Salt Lake Tribune) Matt Pacenza is joined by his son Maxwell as they join the fun as Salt Lake CityÕs Irish community celebrates their 41st annual St. PatrickÕs Day Parade with crowds lining up to take in the festivities. Marching bands, Irish dancers, bagpipes and a sea of green moved along 200 South, starting at 500 East Saturday morning en route to State street where the Siamsa festivities kept the fun going at the Gallivan Center. (Francisco Kjolseth | The Salt Lake Tribune) Shamrocks and sunshine were aplenty as Salt Lake City’s Irish community celebrates their 41st annual St. Patrick’s Day Parade with crowds lining up to take in the festivities. Marching bands, Irish dancers, bagpipes and a sea of green moved along 200 South, starting at 500 East Saturday morning en route to State street where the Siamsa festivities kept the fun going at the Gallivan Center. (Francisco Kjolseth | The Salt Lake Tribune) Members of various Utah Roller Derby teams have fun with the crowds as Salt Lake CityÕs Irish community celebrates their 41st annual St. PatrickÕs Day Parade with crowds lining up to take in the festivities. (Francisco Kjolseth | The Salt Lake Tribune) Haley Jo, a basset hound rescue struts her stuff alongside Jen Straley as they rush to join the parade as Salt Lake City’s Irish community celebrates their 41st annual St. Patrick’s Day Parade with crowds lining up to take in the festivities. (Francisco Kjolseth | The Salt Lake Tribune) Shamrocks and sunshine were aplenty as Salt Lake City’s Irish community celebrates their 41st annual St. Patrick’s Day Parade with crowds lining up to take in the festivities. Marching bands, Irish dancers, bagpipes and a sea of green moved along 200 South, starting at 500 East Saturday morning en route to State street where the Siamsa festivities kept the fun going at the Gallivan Center. (Francisco Kjolseth | The Salt Lake Tribune) Members of various Utah Roller Derby teams have fun with the crowds as Salt Lake CityÕs Irish community celebrates their 41st annual St. PatrickÕs Day Parade with crowds lining up to take in the festivities. (Francisco Kjolseth | The Salt Lake Tribune) Members of the Gold Fish Swim School have a little fun with bubbles during the 41st annual St. PatrickÕs Day Parade in Salt Lake City on Saturday, March 16, 2019. (Francisco Kjolseth | The Salt Lake Tribune) Members of various Utah Roller Derby teams have fun with the crowds as Salt Lake CityÕs Irish community celebrates their 41st annual St. PatrickÕs Day Parade with crowds lining up to take in the festivities. (Francisco Kjolseth | The Salt Lake Tribune) Noni Blake, left, and Brian Morris join the fun as Salt Lake CityÕs Irish community celebrates their 41st annual St. PatrickÕs Day Parade with crowds lining up to take in the festivities. Salt Lake City’s Irish community celebrated the 41st annual St. Patrick’s Day parade with crowds lining up to take in the festivities. Marching bands, Irish dancers, bagpipes and a sea of green moved along 200 South, starting at 500 East on Saturday morning en route to State Street where the Siamsa festivities kept the fun going at the Gallivan Center. Cool temperatures and plenty of sunshine were a perfect match as the luck of the Irish came through after a week that saw more snow.